Few plants are as diverse and useful as the humble tomato. It's alter ego as the "love apple" gives us a small clue as to the supposed aphrodisiac properties of the fruit, whilst on a much more serious note, there have been numerous reports recognising the important cancer combating characteristics of the tomato. The fruits vary in size from that of a small football to a finger nail. Colours can differ from deep purple through the usual red to striped and golden yellow. The best flavoured are certainly not the commercially grown, imported fruits which are mass produced for long shelf-life and transport resistance. Locally and, even better still, home grown are the best flavoured, providing the correct varieties are chosen. These can range from the good old "money-maker" to new hybrid varieties for growing in the smallest of gardens and window boxes. Plant 20 to 30 centimetre seedlings out after the last frosts in very rich soil with either compost or composted manure mixed in. Use ample fertiliser preferable of organic base, Comfrey is very good. With a deep root system tomatoes enjoy deep watering, down to at least 45 centimetres. It is better to water heavily with a small amount of tomato feed fertiliser added to the water than just sprinkling each day. At the same time they don't like to be left "muddy" or standing in water. The top 2 to 3 centimetres of soil should be allowed to dry out between waterings. Consistent watering prevents cracking and blossom end rot. Plant the tomatoes in a very sunny area of the garden. This area should get at least six hours of sun a day, so don't plant anything tall in front of them! Give the tomatoes a place of their own and do not plant them near aubergine, potatoes or other plants of the same family, as they will spread disease and share pests with each other. The insects in your garden will encourage the pollination of the flowers, but on cooler days a gentle tap on the side of the pot to shake the flowers will do almost as well. The very best part of growing your own fruit is picking a few ripe tomatoes on a warm evening and just eating them there and then. Unfortunately, unless you grow lots of plants, you might still have to go out a buy fruit for your dinner as it is almost impossible to leave the ripe tomatoes on the vine! 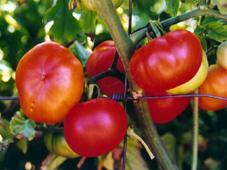 If you are having problems growing your tomatoes at home try these links.